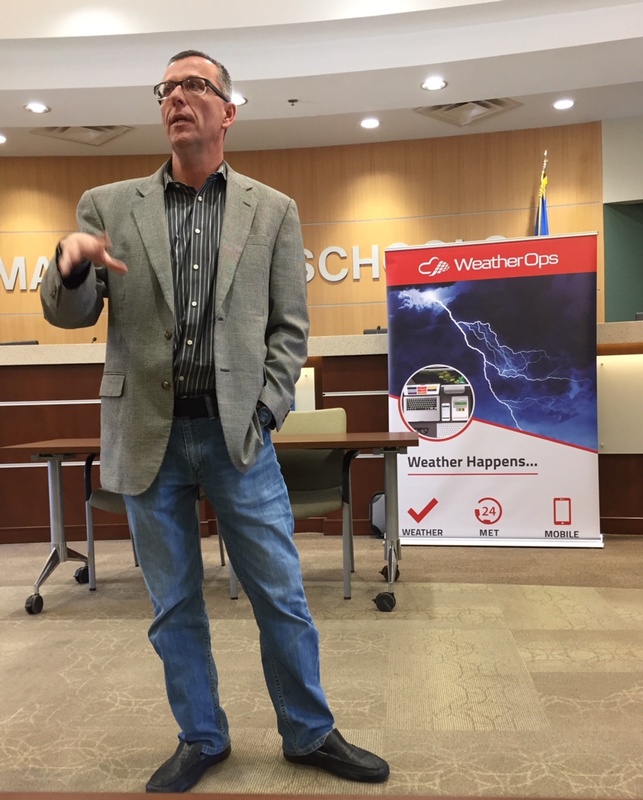 Norman, OK- March 27, 2018 – Representatives from Weather Decision Technologies, Inc. (WDT), an Oklahoma owned business based in Norman, met with administrators of Norman Public Schools (NPS) in late February ahead of Oklahoma’s severe weather season. This annual meeting serves as a refresher for decision makers who utilize WDT’s WeatherOps service to plan for weather impacts, ensuring the safety of students, staff and assets. Weather risk mitigation resources are implemented by districts that experience interruptions of school or after-school activities due to severe thunderstorms, snow or ice. WeatherOps is a powerful, straightforward platform that helps administrations make critical decisions about weather impacts. Beyond immediate impacts, thresholds can be set for wind chill, heat index, and many other weather components that can influence the health or safety of students and staff. "In February, we used WeatherOps data to help determine whether we should schedule a snow day," says Justin Milner, Chief Operating Officer for Norman Public Schools. "Having this data definitely made the decision easier." Decision makers are informed via the WeatherOps mobile app when adverse weather is in the forecast, storm impact is imminent, custom thresholds are exceeded, or are expected to be exceeded during the forecast period. Users are also alerted within milliseconds of lightning strikes within a customizable range, safeguarding those participating in outdoor activities. Finally, when the decision requires a professional, users have access to our team of meteorologists through WeatherOps Metwatch. For more information about WeatherOps, or to sign up for an instant 7-day demo, visit www.WeatherOps.com. Headquartered in Norman, OK, WDT provides organizations with actionable weather analytics and decision support. The company helps clients leverage weather information for profit and safety globally. Hazardous weather detection, prediction, and decision analytics are available via APIs and GIS layers, as well as WDT’s leading risk mitigation SaaS platform, WeatherOps®. WDT takes business continuity activities to the next level by assigning expert meteorologists to monitor global assets and provide live, one-on-one consulting before and during severe weather situations.